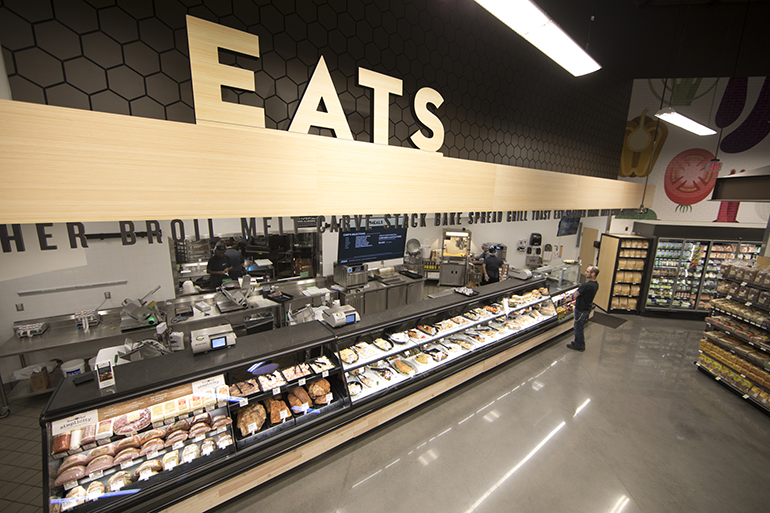 GreenWise Market blends health and wellness with culinary offerings in its new small-format store. Publix Super Markets opened on Oct. 4 a freestanding GreenWise Market in Tallahassee, Florida, that reflects the ongoing evolution of the specialty/natural foods banner. The store has dropped “Publix” from its name and downsized from previous freestanding GreenWise Market incarnations, but it maintains its focus on organic and natural offerings, as well as prepared foods. At 29,000 square feet, it’s about 25 percent smaller than the original freestanding Publix GreenWise Market that first debuted in 2007 in Balm Beach Gardens, Florida. After opening three of the original-format Publix GreenWise Markets, Lakeland, Florida-based Publix switched in 2010 to opening stores under a “hybrid” format that incorporated elements from the GreenWise Market test stores into traditional Publix supermarkets. The retailer also continues to use the GreenWise name on organic, natural and better-for-you private label products in its traditional supermarkets. Now that it has updated the revamped GreenWise Market concept, the company said it is planning to open three more stores under the banner in 2019, in Lakeland and Boca Raton, Florida, and Mount Pleasant, South Carolina, and it has another planned for an unspecified opening date in Marietta, Georgia. • Pours: Kombucha on tap, craft beers, wine, smoothies and coffee, to consume on-premises or to go. The store also offers a seating area in the mezzanine level where customers can relax and enjoy their food and beverage purchases. 1. The Tallahassee GreenWise Market appears positioned to better compete against Lucky’s Market, the small-format, fresh-focused chain backed by Kroger, according to an article in the Tampa Bay Times. The earlier versions of GreenWise were by contrast positioned against Whole Foods Market, which had been expanding rapidly when Publix debuted the freestanding banner. Lucky’s, based in Boulder, Colorado, has opened 13 locations in the past few years in Florida, where Publix has long been the dominant food retailer, and it has several more in the planning stages, according to reports. Lucky’s, founded by professional chefs, features a strong emphasis on quality prepared foods and is known for allowing customers to sip beers on tap as they shop—creating a casual, foodie-driven atmosphere that GreenWise Market also seeks to attain. 2. GreenWise Market has its own loyalty program. GreenWise Rewards members—who must first register with the parent company—receive personalized deals, invitations to in-store events and other benefits. They can also sign up for the GreenWise Market Good Works program, through which the retailer donates to a charity selected by the shopper each time they enter their phone number at checkout. 3. Health and wellness is front and center at GreenWise Market. The Care department, which features a wide assortment of natural and organic health and beauty items, is located near the entrance to the store. GreenWise Market also eschews items such as high-fructose sodas and cigarettes. Unlike most traditional Publix locations, however, the Tallahassee GreenWise Market does not have a pharmacy. 4. The retailer is partnering with Instacart for both delivery and in-store pickup. Customers can order through the third-party delivery service to schedule a delivery, or schedule a time to pick up the items at the store. Pickup customers can park in a designated space in the parking lot and call a number on the sign to have their groceries brought out of the store and loaded into their car by GreenWise workers. 5. The Tallahassee GreenWise Market appears to be in tune with the college market it serves in its location near both Florida State University and Florida A&M University. In addition to beer, wine and kombucha offered in the Pours department, the store also breaks out chicken-wing bars to serve customers stocking up for tailgate and sports-watching parties, and features an assortment of deli party platters customers can order online for in-store pickup. The GreenWise store in Tallahassee, Florida, opened on Oct. 4, 2018. The opening date was incorrect in an earlier version.